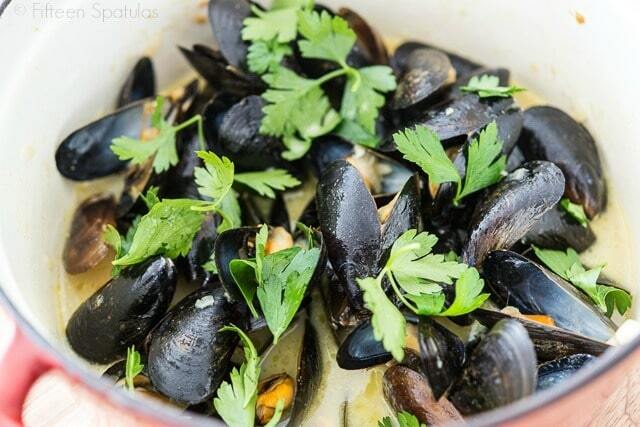 These Thai-inspired mussels are made with creamy coconut milk and spicy green curry. They’re simple to pull together and full of exotic flavor! A few weeks ago I went out to a restaurant in Manhattan that served mussels in every way I could dream of. They had classic versions with white wine and shallots, Belgian wheat beer, and bacon with onions, but they also had bold mussel dishes, like Moules Frites Thailandaise. This Moules Frites Thailandaise had coconut milk, lemongrass, and curry. Mussels with white wine and shallots is a dish I’ve made at home many, many times, but the green curry coconut mussels were so exotic and delicious. I knew I had to recreate it at home and share with you! When buying mussels, the first thing you want to do is get them out of any packaging they happen to be in. One time I had mussels delivered that were sealed tight in a plastic bag, and half of them were dead on arrival (yes, I wrote the company an email). 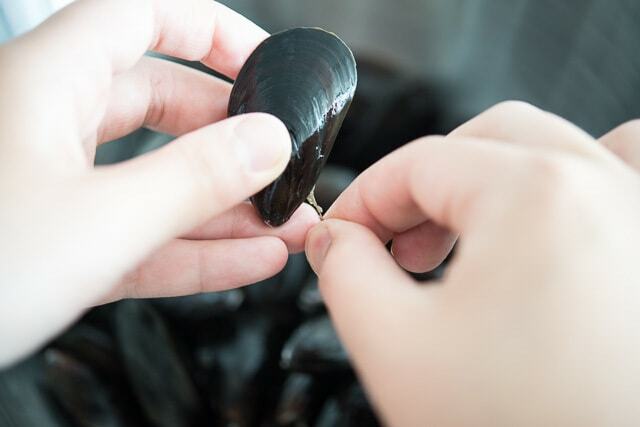 The mussels need to be able to breathe, so place them in a large bowl in the fridge covered with a damp cloth until ready to use, which should be the same day you buy them. 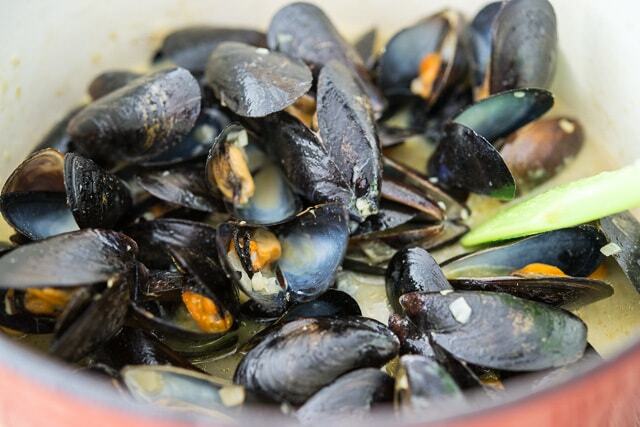 When ready to cook, first we want to get our mussels cleaned up. Grab the beard and pull it straight down toward the bottom hinge of the mussel. Make sure not to pull it any other way but down, or you could kill the mussel. 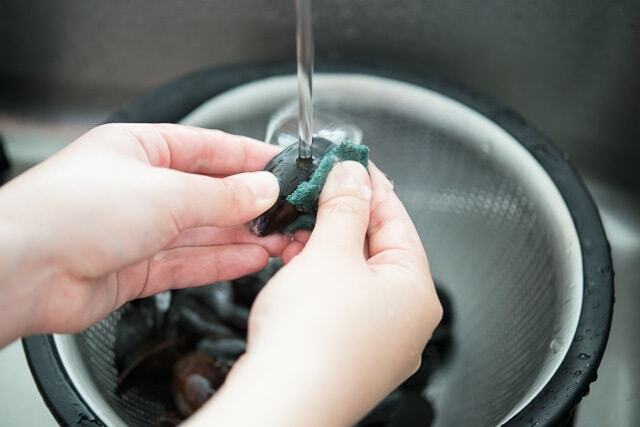 Next, scrub the outsides of the mussel shells with a nylon pad or brush if they look dirty. 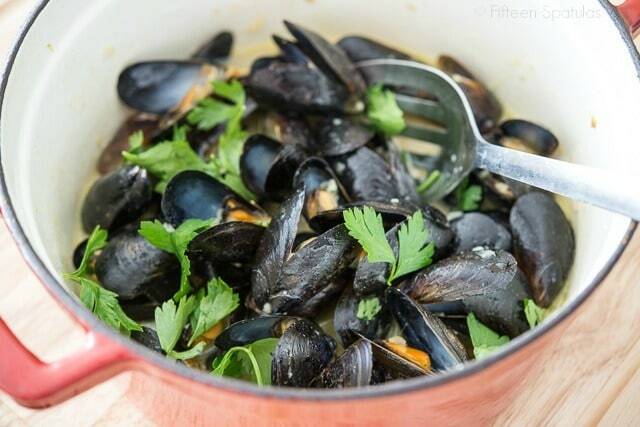 Most of the time if you’re buying farmed mussels, they shouldn’t be dirty or sandy because they’re grown on a line. 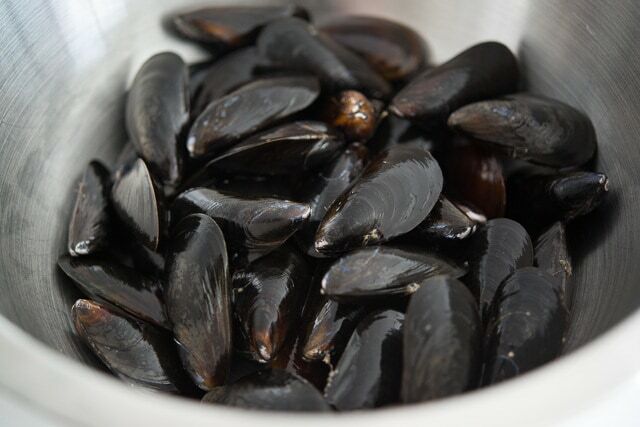 Give them a rinse, and discard any broken, chipped, or open mussels (that means they are dead). Rinse the mussels well, and de-beard them if necessary (see post above if you need further instruction). In a large pot, add the olive oil and onion over medium heat and cook for 3-4 minutes until the onion has softened. 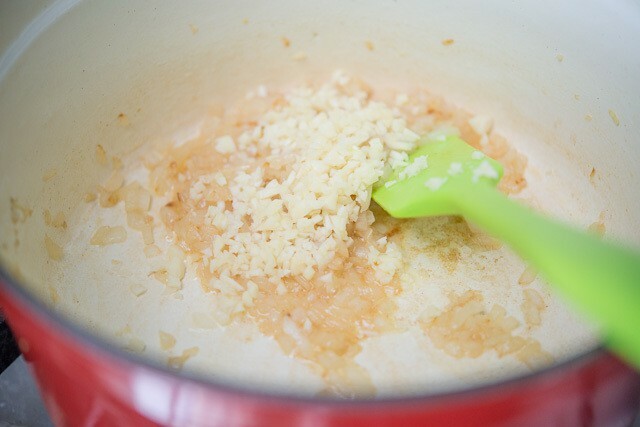 Add the minced garlic and cook for an additional minute, until fragrant. 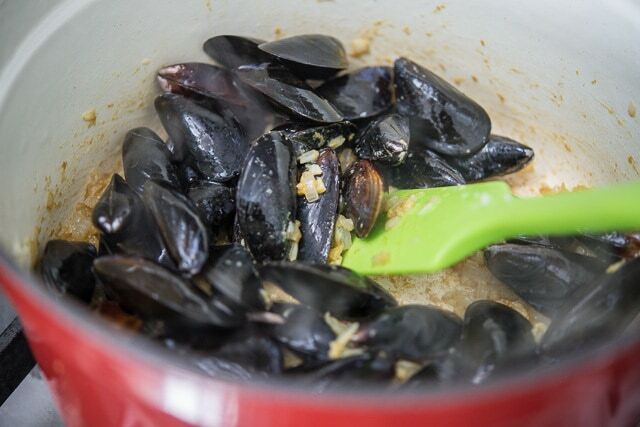 Add the green curry paste and stir to combine, then add the mussels. 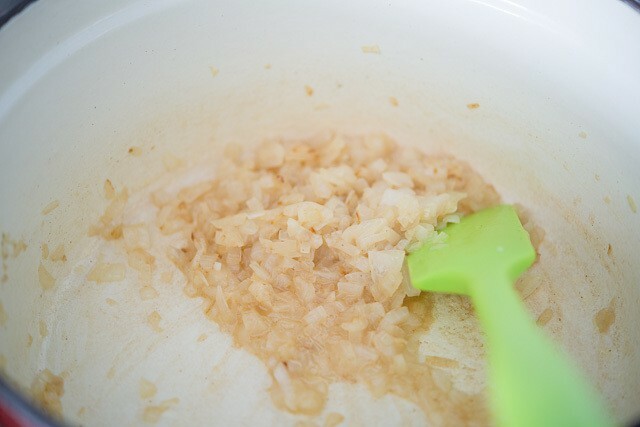 Stir to coat for one minute, then add the seafood stock and the coconut milk. Turn the heat to high, and cover the pan with a lid. Cook the mussels for about 5 minutes until they have opened. 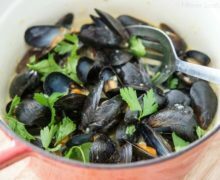 Discard any mussels that didn’t open during the cooking process (this means they were dead), and garnish the dish with fresh cilantro or parsley. Serve, and enjoy! I love mussels! I have to try this soon! This sounds excellent! I love how simple the recipe is, thanks for sharing! My family loves coconut curry mussels whenever we eat out. 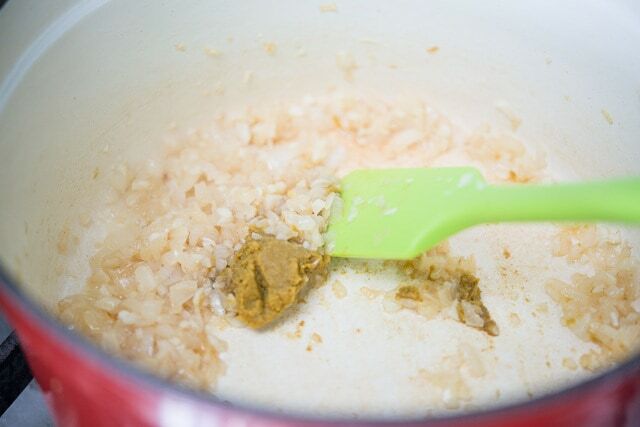 I made some recently using red curry paste – next time, I”ll have to try green curry.